Welcome to the Name Before the Masses tour for Twisted Tales of Deceit by P.D. Alleva. Today you’re going to get some great insight into his book, as well as him as a man and an author. Make sure you leave him some of your other burning questions in the comments. Also enjoy an excerpt from the story and then follow the tour for even more. There’s also a giveaway for you to enter! Please note that affiliate links are present within this post. Should you make a purchase through one, I may earn a small commission to help support my website at no additional cost to you. There were a few inspirations behind the book. Twisted Tales of Deceit features three stories. The inspiration behind The Calculated Desolation of Hope was a dream I had about five years ago. The dream was disturbing enough to stay with me and I just had to put the sequences down on paper. It was originally a poem before writing the story. Somnium was inspired by my day dreaming antics during school, when I would drift off into a story or plot, losing focus on whatever lesson was happening. Knickerbocker, the feature story in this book, was inspired by Washington Irving’s The Legend of Sleepy Hallow, and is a modern take on his classic story. Isaac Crane in Knickerbocker. I was raised close to Sleepy Hallow and lived there for a period of time in my twenties. I must have read Washington Irving’s story dozens of times and had too much fun toying with and putting Isaac Crane through impossible situations, giving in a bit then retracting what was given due to a moral injustice or egocentric behavior he’d engaged in, completely going against his conviction and values. Oddly (considering the ending), Charlie, the main character in Somnium. He’s a dreamer wanting to be the very best at his craft. He’s also a consummate daydreamer which I’ve come to engage in probably a bit more than my wife would like me too. The battle between Isaac Crane and the Headless Horseman in Sleepy Hallow cemetery. I was having so much fun writing this scene I felt like a kid again. I can still see the look on Crane’s face when realizes he’d been duped by Corina, the lead female character, and the Horseman is there to kill him. 100%. Twisted Tales of Deceit is the first book in a series that will feature at least nine installments. Although the stories are standalone books, as the series continues there will be returning characters either featured or a part of additional stories, essentially developing the Beyond the Chamber Door series. I have plans to create a website for the series and publish stories by indie authors that are in line with the theme of the series. Also, as the series unfolds a pattern will emerge that ultimately leads to the final installment, binding all the stories together. And we will indeed be hearing from Charlie again. Five reasons: 1. Entertaining 2. Perfect for the Halloween season 3. Thought provoking and disturbing 4. Strong characters thrown into dark circumstances 5. Thrilling plot twists and deceitful endings. I consider myself a literary fiction author with an understanding of the dark side of the human condition and the possibility of redemption. I would hope that any reader would appreciate the blending of dark and light and find either an inspiration through being wise and privy to the dark influences that impinge on our lives or a warning against inflated egos, the influence of corrupt and powerful minds, and engaging in self-defeating behavior. Write what is true to the heart, know and understand the thought process of the readers and what they are looking for. Indifference is a psychological story about a misdiagnosed paranoid schizophrenic who discovers he has the power to heal other people and that his delusions are real. This is my first published book. I chose the title due to its relevance to the story. Bishop, the main character, believes that nothing he does will make a difference to the larger world. Also, because I’m a huge Pearl Jam fan and their song Indifference is in my top five PJ songs. The song’s message reflects the message in the book. Let Your Soul Evolve: Spiritual Growth for the New Millenium is a philosophy and self help book written during my time as an owner and clinical director of a mental health and addiction recovery center. I am a co-author on this book along with Phil Diaz, an expert in the field over the past 40 years, and Antonio De Nicoloas, a world renowned philosopher who’s written over 40 books. I’ve recently written a behavioral protocol and workbook to compliment the instructions and philosophy in the book and completed a video series teaching the techniques of mindfulness, Buddhist meditations and positive affirmations. A Billion Tiny Moments In Time is a Family Saga that explores the question of immortality, family secrets and courage in times of severe adversity. The story traces a prominent upscale New York family over four generations, chronicling the main characters Tom and Lola Bitmore’s struggles when their son, Timothy is diagnosed with a rare form of cancer. Presenting the Marriage of Kelli Anne & Gerri Denemer A Horror Story is scheduled for release this November 11th. The story explores dark themes such as the butterfly effect and impact of suicide, miscommunication within marriage, evil influences on our decisions, and addiction with an ultimately inspirational theme that we are all connected and through love we find redemption. 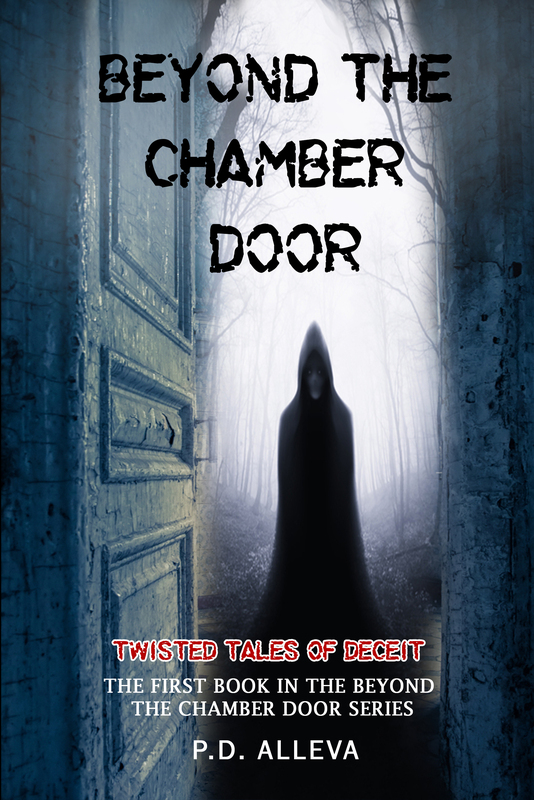 This story is the second book in the Beyond the Chamber Door series which features stand alone stories in every installment. Currently I’m writing book three of the series, a dystopian sci-fi story titled, The Rose that takes place at the tail end of World War III. After this story is complete, I’m delving into the next book, titled Golem, about a 1940’s socialite whose male sculpture comes to life after a breakup with the love of her life. I like to explore themes that incorporate light and dark, love and hate, and good and bad. As in life, sometimes good wins, sometimes dark hearts prevail. I’m an early riser. I like to drink my coffee and listen to different types of music to get me in the mood with whatever story I’m currently writing. Sometimes it’s the Beatles, sometimes 80’s love songs and often 90’s grunge (love my generation). Or I blast meditation music to get that healing vibration coursing through the house and my brain functioning at an optimal level. Once the mood is right, I delve into writing. 100% Fact Mr. King. I consider On Writing a must read for any author. Not only is his advice on writing spot on (after all he is the King), but also the first part of the book chronicles the winding road that brought him into a successful writing career. There’s so many good tidbits in this book, it’s a must read. I wouldn’t say who but what. Inspiration can come from anywhere really. A song, a band, a period in time, a movie, or just witnessing a random act of kindness. Mostly music though, songs that hit the emotional cord needed for the story that is unfolding. As for an actual ‘who’ I’d have to choose my wife, Lisa. She is my inspiration behind everything I do. Dan Brown’s Inferno, Ernest Hemingway Islands in the Stream, and HP Lovecraft The Dunwhich Horror and Others. Next up on the TBR list: A Dress the Color of the Sky, The Black Heart of the Station, and Echo Vol 1: Approaching Shatter. I like to mix up the reading list between indie and classic authors. Reading, acting like a child with my boys, playing baseball and basketball, attending their karate classes, basketball practices and games (life revolves around the kids), watching movies, Dateline or Ozark with my wife, and every once in a while we actually get a date night. And of course meditating. Deerfield Beach. Probably my favorite place to go. Great beach, great pier and easy going atmosphere. If you are going there’s a few restaurants I highly recommend: The Whales Rib (get the lobster bisque trust me you wont regret it) for seafood and Amante’s for Italian or sit at the Patio Bar and watch the waves. Live music is always happening at multiple places throughout the week. Wanted to go skydiving all my life. I’m afraid of heights but that didn’t stop me from going on my 40th birthday. Immediately after jumping from that plane all fear is completely gone, replaced by pure 100% elation. Next on the list is a trip to Easter Island, Hawaii, and New Zealand. I was a FULL TIME single dad for four years before meeting my current wife. Sorry but I have to emphasize the full time, usually I get rolling eyes like I was a weekend see you every other Wednesday dad. Not that there’s anything wrong with that. My son is about to turn 19 and my daughter 16. (teens are definitely a new ballgame). We used to live in a one bedroom apartment, it was small and crowded but some of the best times in all of our lives. I put myself through school during this time, receiving an MSW and wrote two fiction books, Indifference and A Billion Tiny Moments In Time. Hard work does pay off. Special thank you to Candrel’s Crafts, Cooks, and Characters for supporting indie authors and this author interview. He stared into the mirror, hoping Jimmy would talk. But the room was too bright, and Charlie remembered that Jimmy liked the dark, so he turned off the light, lit a candle which he placed on the sink by the mirror, which started to waver, like a stone dropped into water causes circular ripples. P.D. Alleva is an author, psychotherapist and hypnotherapist specializing in trauma, addiction and mental health. He is the author of several books, including fiction novels, Indifference and A Billion Tiny Moments In Time…, Seriously Twisted; These Gods of Darkness (Poetry), Let Your Soul Evolve (1st and 2nd ed), and Spiritual Growth Therapy: Philosophy, Practices and Mindfulness Workbook (non-fiction). He has developed behavioral protocols for addiction and mental health and teaches mindfulness, Buddhist meditations and manifestation techniques to his patients as a means and alternative to using pharmaceuticals. Go to spiritualgrowththerapy.com to learn more. Mr. Alleva offers a special discount on his video tutorials for his readers, so please use Promo Code 7474 for a special 90% discount. He is currently in private practice with his wife, Lisa. He lives with his wife and children in Boca Raton, Florida. P.D. Alleva will be awarding a $50 Amazon/BN GC to a randomly drawn winner via rafflecopter during the tour. This book sounds perfect for this time of year. Thank you. I wrote “Knickerbocker” specifically for the Halloween Season. Enjoy the story. thank you, thank you. Happy Reading! Thanks for hosting, sounds like a really good book. Thank you Rhonda. Happy Reading! Awesome. Thank you Nikolina. Enjoy the book. Thank you Danielle. Hope you enjoy it. If you’d like connect with me on Facebook, I’d love to know your thoughts on the story.